Into every generation a Slayer is born: one girl in all the world, a Chosen One. She alone will wield the strength and skill to fight the vampires, demons, and the forces of darkness. She is the only Slayer. Or, at least, she was. I’m going to be frank and say, I enjoyed the hell out of this book. I will say that I was also terrified picking this book up. Buffy is one of those series that I watched religiously and loved every second…except for the college years. We do not speak of the college years, except for one episode and we all know which one that is. Also, eff Riley….cough…I’m fine now. As I was saying before I began to ramble, as a fan of the show and the movie, it was important to me that this be faithful to the characters and world that I loved so much. Also, I got the Barnes & Nobles edition of the book so that I can get the bonus Faith scene, just because it’s Faith. Words can not express how much I’ve always wanted more from the Buffyverse and how happy I am that Kiersten White is the writer. I’ve loved her humor in previous books like Paranormalcy and thought she did a great job mixing paranormal, the girl of prophecy trope, and humor, which fits Buffy’s world to a T. I was pleasantly surprised by how much I enjoyed this book. It felt like a part of the Slayerverse. If you’ve never watched Buffy the Vampire series, I think there might be some things that you might not get at first but the book does a good job of explaining some of it. But let’s be real, there were a lot of seasons and way too much to try and explain it all in the book. In reality, you’d need to watch the movie first as that’s where Buffy finds out she’s a Slayer and her story really begins. In the movie, Merrick was Buffy’s first Watcher, the person who guides the Slayer in her destiny to fight the evil vampires and he is killed by Lothos, a master vampire, while trying to protect her. Buffy, still young and learning her powers, defeats Lothos with the help of her “keen fashion sense” and eventually ends up in Sunnydale, home of the Hellmouth which is where the TV series begins. Eight seasons later and a comic book series, we get this lovely addition to the story where we see that Merrick has left behind a wife and twin daughters, Athena (Nina) and Artemis where we learn that one of the twins is destined to save the world, while the other destroys it. Throughout the book, we also get a glimpse of a mysterious figure who is trying to stop the prophecy from happening. At the Watcher Academy, or what’s left of it, we find the girls trying to keep the future of the Watcher’s alive since Buffy has done a big no no. She’s unleashed the power that makes the Slayer the Chosen One and released it for any girl who had the potential to be a Slayer. She’s also sort of nixed magic in a big way. Nina works as a healer, studying the different types of demons, while Artemis although having trained all her life has recently failed her Watcher’s exams and not sure what to do with herself. We’re also introduced to their friend Rhys, however, has passed his Watcher exams and Imogen, cares for “The Littles”, the Watcher’s kids. 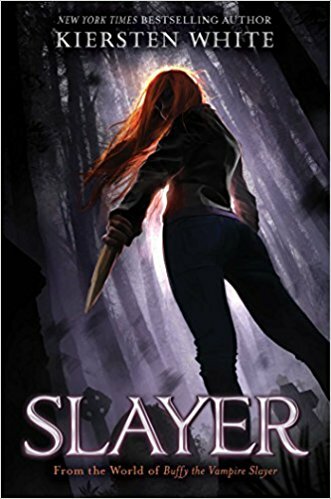 When walking the grounds, Nina is nearly attacked by a hellhound, but instead, instinctively kills it and the gang realizes that she is not only a Slayer, but the last Slayer, thanks to Buffy’s actions. Now in training, Nina has to face difficult decisions when it comes to killing demons when she’s always trained to be a healer and her moral compass makes her question if all demons are truly evil or just labeled as so. She also has to deal with her old crush who is now her Watcher Leo, family drama between Nina, Artemis and their mother, and trying to save others from some demon who’s going around sucking the life out of people, literally. Sprinkle a happiness demon who loves Coldplay, some quips, and lots of action, you have a pretty entertaining read. I will warn you though that this is the first book in the series, so while the book doesn’t technically end in a cliffhanger, it is open and there are things that didn’t happen or wrap up in the book. I’ll also say, the ending did feel a tad rushed and it kills me that I can’t explain because it spoils it but I’ll just say that I thought the epilogue might happen in the next book instead, which I would have been fine with. I sort of felt it could have been expanded a bit. I think the last two pages from the perspective of the mysterious hunter and that “OMG it’s this person?” would have been a better stopping point, personally. It sort of brings what happened in the beginning full circle. Also, I was never sure if Buffy realized who Nina actually was, besides being another Slayer so I hope that gets cleared up too. All in all, I am down for more books in this series and I am aching for more. So good!